Core Java, Java App Dev, Learn Java, others, Programing, by admin. In Datastructures and algorithms in Java, Part 2 I introduced a variety of techniques for searching and sorting one-dimensional arrays, which are the simplest arrays. In this article we’ll explore multidimensional arrays. I’ll introduce the three techniques for creating multidimensional arrays, then show you how to use the Matrix Multiplication algorithm to multiply elements in a two-dimensional array. I’ll also introduce ragged arrays and show you why they are popular for big data applications. Finally, I will answer the question of whether an array is or is not a Java object. A multidimensional array associates each element in the array with multiple indexes. The most commonly used multidimensional array is the two-dimensional array, also known as a table or matrix. A two-dimensional array associates each of its elements with two indexes. We can conceptualize a two-dimensional array as a rectangular grid of elements divided into rows and columns. We use the (row, column) notation to identify an element, as shown in Figure 1. Because two-dimensional arrays are so commonly used, I’ll focus on them. What you learn about two-dimensional arrays can be generalized to higher-dimensional ones. This syntax states that a two-dimensional array is an optional, comma-separated list of row initializers appearing between open- and close-brace characters. Furthermore, each row initializer is an optional, comma-separated list of expressions appearing between open- and close-brace characters. Like one-dimensional arrays, all expressions must evaluate to compatible types. This example creates a table with two rows and three columns. Figure 2 presents a conceptual view of this table along with a memory view that shows how Java lays out this (and every) table in memory. Figure 2 reveals that Java represents a two-dimensional array as a one-dimensional row array whose elements reference one-dimensional column arrays. 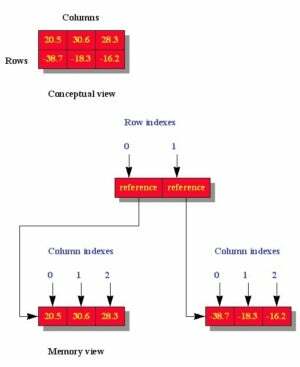 The row index identifies the column array; the column index identifies the data item. new double // Create a four-row-by-three-column table. Like one-dimensional array variables, a two-dimensional array variable is associated with a .length property, which returns the length of the row array. For example, temperatures1.length returns 2. Each row element is also an array variable with a .length property, which returns the number of columns for the column array assigned to the row element. For example, temperatures1.length returns 3.
double temp = temperatures1; // Get value. temperatures1 = 75.0; // Set value. The first example returns the value in the second column of the first row (30.6). The second example replaces this value with 75.0. If you specify a negative index or an index that is greater than or equal to the value returned by the array variable’s .length property, Java creates and throws an ArrayIndexOutOfBoundsException object. Multiplying one matrix by another matrix is a common operation in fields ranging from computer graphics, to economics, to the transportation industry. Developers usually use the Matrix Multiplication algorithm for this operation. How does matrix multiplication work? Let A represent a matrix with m rows and p columns. Similarly, let B represent a matrix with p rows and n columns. Multiply A by B to produce a matrix C, with m rows and n columns. Each cij entry in C is obtained by multiplying all entries in A’s ith row by corresponding entries in B’s jth column, then adding the results. Figure 3 illustrates these operations. Figure 3. Each of A’s rows is multiplied (and added) with each of B’s columns to produce an entry in C.
Matrix multiplication requires that the number of columns (p) in the left matrix (A) equal the number of rows (p) in the right matrix (B). Otherwise, this algorithm won’t work. Because of the three FOR loops, Matrix Multiplication has a time complexity of O(n3), which is pronounced “Big Oh of n cubed.” Matrix Multiplication offers cubic performance, which gets expensive time-wise when large matrixes are multiplied. It offers a space complexity of O(nm), which is pronounced “Big Oh of n*m,” for storing an additional matrix of n rows by m columns. This becomes O(n2) for square matrixes. I’ve created a MatMult Java application that lets you experiment with Matrix Multiplication. Listing 6 presents this application’s source code. MatMult declares a pair of matrixes and dumps their values to standard output. It then multiplies both matrixes and dumps the result matrix to standard output. Let's explore a problem that is best solved by matrix multiplication. In this scenario, a fruit grower in Florida loads a couple of semitrailers with 1,250 boxes of oranges, 400 boxes of peaches, and 250 boxes of grapefruit. 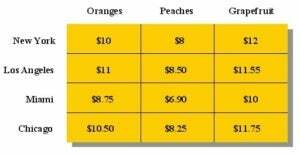 Figure 4 shows a chart of the market price per box for each kind of fruit, in four different cities. Sending both semitrailers to Los Angeles will produce the highest gross income. But when distance and fuel costs are considered, perhaps New York is a better bet for yielding the highest income. The first and third examples create a two-dimensional array where the first row contains three columns and the second row contains two columns. The second example creates an array with two rows and an unspecified number of columns.